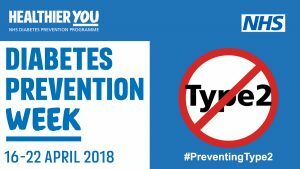 A diabetes charity working with the NHS in the East Midlands is marking Diabetes Prevention Week (16 – 22 April 2018) by hosting free assessments for type 2 diabetes in towns and cities across the region. Silver Star will be offering free risk assessments and blood tests for type 2 diabetes in a number of East Midlands locations between Monday 16 and Friday 20 April, giving people the chance to find out if they are at risk of developing type 2 diabetes. Anyone identified as being within the risk threshold for type 2 diabetes will be offered the chance to take part in the Healthier You: NHS Diabetes Prevention Programme. This gives them access to a free, local, tailored education programme, so they have the information and support they need to lead a healthier lifestyle – and lower their risk of developing the condition. Nikki Biddlestone, from Hucknall said: “Finding out I was pre-diabetic was a life changer for me, I was shocked at first but having a family history I knew it was a possibility. But, by making small changes to my diet, and doing a bit more exercise, my sugars are now well in the healthy range. It’s completely changed my outlook on food and fitness. I’m pleased that I’ve made the changes now rather than when the damage had already been done”. Dr Yassir Javaid, clinical lead for the NHS Diabetes Prevention Programme in the East Midlands, said: “Thousands of people across the East Midlands are at risk of developing type 2 diabetes. The risk is particularly high for men over 40; people who are overweight; people with high blood pressure; people of South Asian, African Caribbean or Black African background, and anyone with a family history of type 2 diabetes. “Thanks to the NHS Diabetes Prevention Programme, those at risk can get the support they need to take action – and by making small changes towards a healthier lifestyle, they may never develop the condition. If you think you might be at risk of developing type 2 diabetes – or you’re just curious to find out more – why not pop along and meet the team at a roadshow near you during Diabetes Prevention Week?